UPDATE: The National Weather Service confirms an EF2 tornado in Spartanburg County. 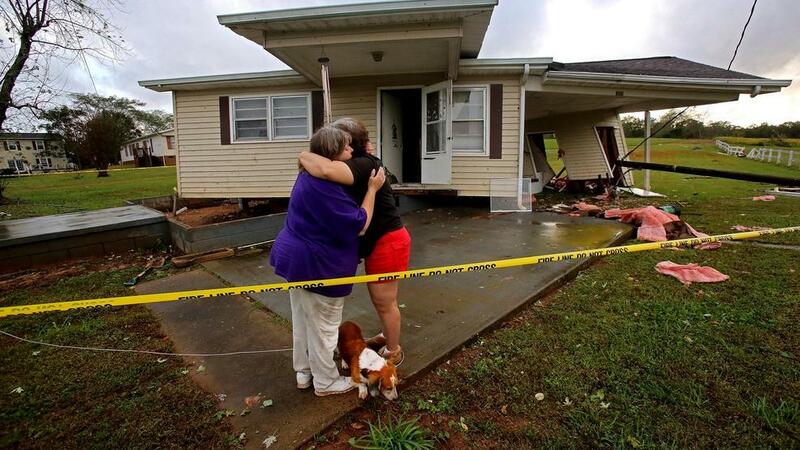 The Carolinas are cleaning up after being slammed by severe thunderstorms with flooding and damaging winds, possibly even tornadoes that flipped tractor-trailers and small planes, broke storefront windows and pushed at least one house off its foundation. At least 98,000 homes and businesses lost power, forcing some schools and parks to close Tuesday. The National Weather Service reported that many trees and power lines were brought down Monday afternoon and evening across western North Carolina and South Carolina. Possible tornados left trails of damage, and small planes were flipped over and their hangars crumpled at the Hickory Regional Airport. Daily rainfall records were reported in Asheville and Charlotte in North Carolina, as well as the Greenville-Spartanburg area in South Carolina. Totals ranged from about 2 inches (5 centimeters) in Charlotte to more than 3.5 inches (9 centimeters) in Asheville. Streets were under water in Asheville and Boone, and firefighters rescued drivers from flooded roads in Pickens County in western South Carolina. As many as nine tornadoes were reported in the western Carolinas. The weather service office in Greer, South Carolina, said Tuesday morning that one crew was working to confirm tornado damage in Spartanburg and Cherokee counties in South Carolina and Cleveland County in North Carolina, while a second crew was focusing on the rest of western North Carolina. The worst problems appeared to be in Spartanburg, South Carolina and Hickory, North Carolina. The storms closed two state parks in North Carolina, spokeswoman Katie Hall said. Chimney Rock State Park was closed while crews dealt with damage that included a landslide. Stone Mountain State Park in Roaring Gap, North Carolina, was also closed because of downed trees. "You could hear it howl through downtown," Michael Parsons, whose Michael's Jewelers store in North Wilkesboro was damaged when a nearby roof blew off, told WXII News 12, the local NBC affiliate. JoAnn Perez arrived home shortly after the storms passed to see her home pushed off its concrete slab, but her dogs and cat inside it were unharmed, in Shelby, North Carolina. No deaths have been reported from the storms. Spartanburg Regional Hospital said it had treated eight people with minor injuries. Duke Energy said by late Tuesday morning, its crews were still working to restore electricity to more than 78,000 customers. About 66,000 were without service in North Carolina and another 12,000 were powerless in South Carolina. In South Carolina, an apparent tornado crunched buildings, flipped tractor trailers, downed trees and wrecked homes in the Spartanburg area. The Highway Patrol reported approximately 20 accidents in Spartanburg County, as well as traffic light malfunctions and trees down in roadways Monday afternoon.